You need do only one thing to put Great Texas Fundraiser to work for your organization. 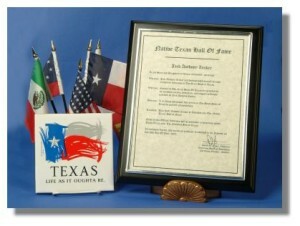 That is, to take steps to place your qualified Texas organization in Friends of Texas. To do that requires that you support one other Friend of Texas organization one time. That’s it. It’s a one time investment without further obligation. Once you’ve supported the existing Friend of Texas of your choice, you’re permitted to nominate your qualified Texas organization for inclusion in Friends of Texas. Additionally, either you, or your designee is eligible for admission into the Native Texan Hall of Fame. These actions serve a two fold purpose. You’re now in the “Wealth Flow” which makes your organization eligible for Friends of Texas income. Further, it provides you with familiarity and insight into the product that will lionize your new inductee. This new found familiarity makes communicating the benefits of becoming a qualified Friend of Texas simple. This knowledge is necessary for your success. When your presentation is ready, we’ll go to work presenting your qualified Texas organization to a large and growing audience. Your organization will benefit from our annual holiday drives built around Mother’s Day, Father’s Day, Valentines Day and others.